The set of wonderful athletes who represented and did Nigeria proud at the recently concluded Rio Paralympics, setting records, have returned to the country. 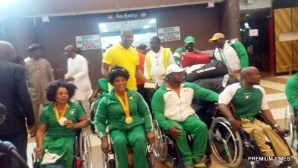 The team, which won a record 8 gold medals at the Rio Paralympic games, arrived the Nnamdi Azikiwe International Airport, Abuja, on Sunday evening to the scores of well wishers who sang and danced to welcome them. Similarly, Officials from the Ministry of Sports were at the airport to welcome the team as the National Anthem was sung for the victorious athletes. Speaking on behalf of the Sports Minister, an official of the Sports Ministry, Luca Jonathan Mangset, told the press that Nigerians were proud of the athletes. Nigeria “is very proud of them for making the country proud,” he said while welcoming the athletes at the airport. Mr. Mangset said a more elaborate event will be held to celebrate the Paralympians. The assistant captain of the Nigerian team, Esther Oyema, said she and her teammates were very happy with the welcome they received. Esther, who won silver in the Powerlifting Women’s -55 kg category in Rio, said she and her colleagues were motivated to do better at the next competition. Apart from the eight gold medals, the team also won two silver and two bronze medals setting six new World Records in the process.